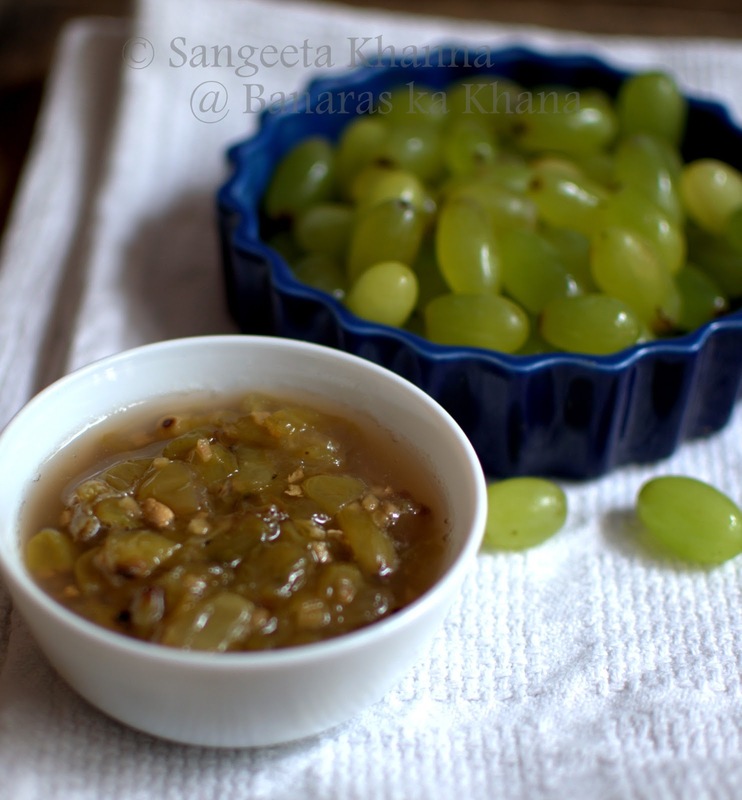 Angoor ki chutney or green grapes chutney is no less than the Mango chutney we love with our Indian meals or with crackers and cheese. While I myself don't eat much chutneys and jams, Arvind loves them. He loves the jams, marmalade and such chutneys more than fresh fruits sometimes. I am more for the fresh fruit but then such chutneys are a good way to use up any leftover fruits or when you buy in bulk and can't consume so much fresh. I do buy fruits and vegetables in huge bulk sometimes, being greedy for fresh produce always. This tendency makes me guilty of wasting them a few times as well, though I try and give away the extra to the house help. This chutney is an Indian way of using fruits for making a sweet and savory, sometimes hot with chilies preserve. 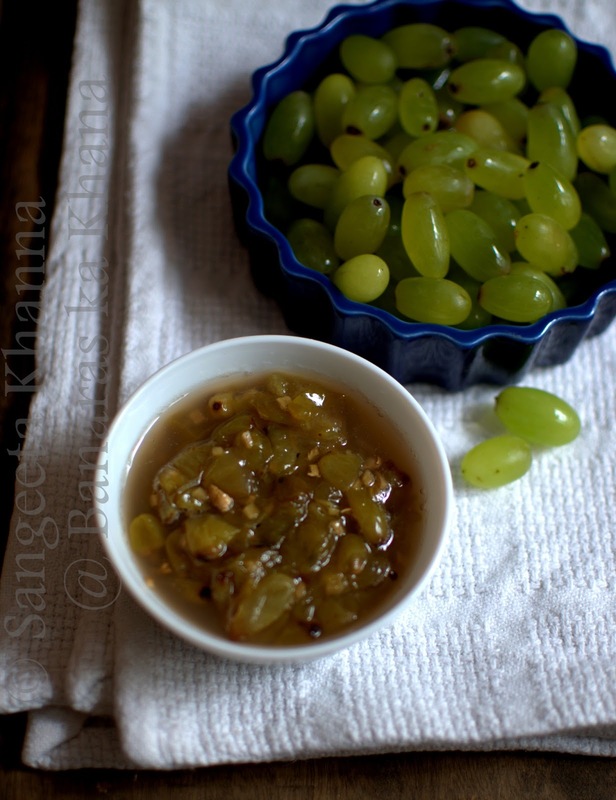 Also called as launji, this type of chutney can be made with any sour fruit or vegetbale, some neutral vegetable also make good launji and raw papaya launji is as good as kachhe aam ki launji, the recipes will differ obviously. Khatte angoor ki launji may have some roasted cumin powder too, but we all make them the way we like. Some people love a hint of garam masala too in this angoor ki chutney or launji, even I like it occasionally. This tomato chutney is more popular as a daily thing. Basically a condiment that is served along with an Indian thali meal, it serves the purpose of a palate cleanser. More popular in the central states of India, I have seen Bengali families serving such chutneys (cooked with more sugar content) at the end of the meal, just before desserts. There are food traditions and there are recipes, modern life doesn't give us many chances to eat traditionally laid out meals but we enjoy the taste elements in bit and pieces. Like this chutney will be on a toast some day, on a cracker with cheese some other day and will be had with a paratha meal some other time. I kept the sugar content lesser in this chutney, it still keeps well for a week at room temperature, for longer shelf life it's better to refrigerate. The chutney is a basic jam with lesser sugar content and lesser degree of set. More sugar added will cause the chutney to set like a jam as sugar causes the pectin the fruit to gel. Chop the grapes in halves or as you like. Mix all the ingredients in a wide and thick bottomed pan and cook on a medium flame. The mixture will come to a boil, start frothing and then bubbling merrily while it reduces. You should keep a watch on the liquidity of the cooking mixture as if the flame is high it would dehydrate faster and might need some more water added. Total cooking time on medium heat would be around 25 minutes but you just have to stir it in between and keep an eye. You can do other chores on the sly. You can always add some whole black peppercorns to this chutney, some roasted fennel seeds powder or a mix of roasted fennel and fenugreek. Some red chilly powder will be awesome too if you like a kick. We Indians made the fruit jams spicier and tangier. I hope you would love having these chutneys with your meals. So try these if you haven't had them earlier. Those who know these chutney, know what I am talking about. Thanks for sharing, Simple and easy.